When play Blu-ray and DVD movie on Panasonic TV, the normal way will be using a Blu-ray Player. But if your Blu-ray and DVD discs purchased from Amazon or local shops are region-locked ones, your Blu-ray Player maybe meet playback issues due to the region codes. Rip and convert Blu-ray/DVDs to Panasonic TV MP4 files allows you stream Blu-ray and DVD movies on Panasonic TV from external hard drive or over the network. So how to convert Blu-ray/DVD to MP4 for Panasonic TV? To rip Blu-ray and DVD to MP4, you need a Blu-ray Ripper. A Blu-ray Ripper not only can decrypt commercial Blu-rays but also can remove DVD copy protection then rip/convert Blu-ray and DVD movies to Panasonic TV MP4 format. There are many Blu-ray Rippers in the market. While the best Blu-ray Decrypter to help you convert Blu-ray and DVD to Panasonic TV is aPubsoft Blu-ray Ripper. 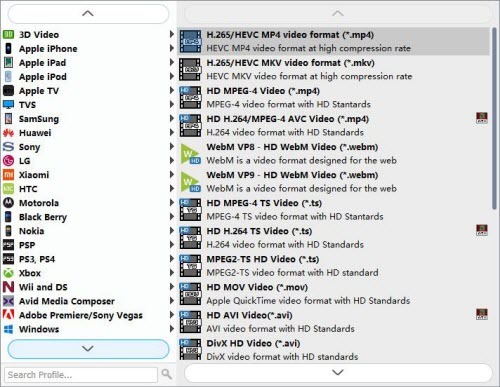 If you want to convert Blu-ray/DVD to MP4 on Mac, you should use aPubsoft Blu-ray Ripper for Mac which allows you rip Blu-ray/DVD on Mac OS X(High Sierra, Sierra, El Capitan, etc). How to Convert Blu-ray or DVDs to Panasonic TV? Step 1. Load Blu-ray or DVD movie. Launch aPubsoft Blu-ray Ripper as the best Blu-ray/DVD to Panasonic TV Converter on your computer, “Load Disc” button to load Blu-ray or DVD into this program. You can choose your desired one at “Subtitle” then the subtitle streaming will hard burn to your video. In this way, when you play Blu-ray and DVD on Panasonic TV from home library, your TV only need to read one file in case you play video on TV without subtitle. Click “Profile” bar, from its drop-down list, select Panasonic TV supported playback HD MP4 file format. “HD Videos > HD MPEG-4 Video (*.mp4)” format is recommended for faster conversion and best movie effect. 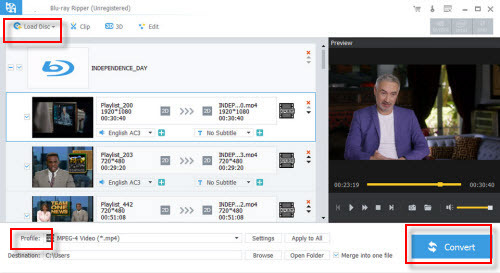 Tip: For better ripping Blu-ray/DVD to MP4, you can customize video and audio options, such as Video Codec, Video Bitrate, Audio Codec, Audio Bitrate, Audio Channel, etc. Click on the “Convert” buttom to rip/convert Blu-ray and DVD to MP4 for Panasonic TV with best quality. After the Blu-ray/DVD ripped to MP4, you can click “Open Folder” button to get the generated .mp4 files.Now, you can transfer your Blu-ray and DVD rips to USB flash drive, then plug the USB drive into the USB port on the Panasonic TV to watch the Blu-ray/DVD movies.